Yes, you have read well: “Priest-chokers”! This is what “Strozzapreti” means. But do not worry: no casualty ever reported suggest they might literally work that way on any member of the clergy. The eccentricity of the name, though, always raises a giggle and the same spontaneous question: where does this name come from? Actually there is no certainty about it. The darkest of all hypothesis, link it back to the anticlerical rebellions in the territories of the Pontifical States which have been under the direct rule of the Pope from the 6th century to 1870. Romagna – the homeland of this pasta – was part of their eastern regions. Apparently, rebels used to “take care” of the undesired ministers with a twisted leather rope, similar to a harmless shoestring. Less ferocious tales from earlier times, instead, talk about the common habit of presenting the priest – who came for blessing your home, or simply for a visit – with basic goods like wine, bread or eggs. In times when having just a couple of chicken was considered a blessing, giving up the only daily egg was certainly not the easiest thing to do. It meant the pasta wouldn’t have been as nourishing as if it had an egg in it. So, I guess the name was just a “spontaneous wish”, muttered both by the frustrated kneading housewives and their hungry husbands. The proportions of the two different flours indicated can vary: this pasta can be made either only with durum wheat semola flour or only with soft wheat weak flour. The percentage of water the mixture will be able to a absorb will consequently vary. 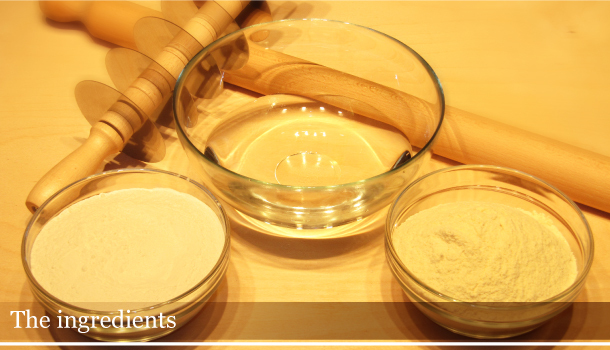 I will soon write a post about flours and their properties. (step 1 - pic. A). With your hand, start forming a well in the middle of the flour. Collect about 50gr of it into a small receptacle or keep it aside: it will be used to adjust the consistency of the dough. Enlarge the well spreading the flour with circular movements from the centre to the edges (step 1 - pic. B). Gradually pour small amounts of water from the jug into the centre of well and mix them thoroughly with small amounts of flour using the fork like if you were scrambling eggs. Trying not to form lumps (step 2 - pic. A). Gradually scrape flour from the bottom of the inner edges, so the liquid mixture will not flood out. Keep adding the water till all the 200gr have been mixed with flour into a very soft and gluey mixture (step 2 - pic. B). With your hands or with a scraper, quickly mix the soft dough to the rest of the flour, forming a lumpy cluster. Work the dough incorporating the still dry flour into the dough. This is the last chance you have to adjust the consistency of the dough, and it is all up to you to decide wether or not to add more water from the 30gr left aside. Since I do not know what kind of weak flour you are using, I can not give you more precise indications. The lesser the proteins contained, the weaker the flour is and the lesser water it will be able to absorb. Now, the gluten that has been formed combining the water and the proteins in the flour (gliadin and glutenin) needs to be worked into a gluten-net, which will give the dough it’s nerve. Make a rough ball with the dough, then one hand only, compress the dough with your wrist sliding it toward the outer end (step 4 - pic. A). With your fingers, collect the end and roll it back overlapping the edges (step 4 - pic. B). Repeat again this for another couple of times (step 4 - pic. C). Then rotate the dough of 90 degrees, so the seal will be vertical to you (step 4 - pic. D), and start over kneading as you did before. Repeat this again until the dough will get smoother and won’t stick to the kneading board anymore (step 4 - pic. E-F). Because of the durum wheat semola flour, this dough will not get perfectly smooth as it would be if it was made only with soft wheat flour. So as soon as you see that the dough will resist to your kneading, you can stop working. To be sure it is perfectly done, press the dough with one finger tip and release it: you will see dough reacting almost like rubber and filling back the finger print. Unless you have been using only soft wheat flour, which would allow you to roll out the dough immediately, this dough will need to rest. The resting will relax the gluten-net so the rolling out will be easy and almost effortless. So it is important not to work the dough again after the resting otherwise the gluten-net will start reacting again and the dough will shrink back after each movement of the rolling pin. Shape the dough into ball and flatten it. Wrap it into cling film and put it to rest in the fridge for 15-20 minutes. Put the water on a high heat, it will take almost 15 minutes to come to the boil. Dust the kneading board with some flour, unwrap the dough and put it on top of it, then lightly dust the top and spread it with your hand (step 6 - pic. A). Do not add any more four from now on, otherwise the dough will dry out and will start to crack (step 6 - pic. B). Quickly drive up and down the rolling pin at its centre leaving the end untouched. Rotate the dough of 90 degrees and repeat the same movements. Keep rotating the dough and rolling it out always from the centre out, trying to leave the edges always a bit thicker than the centre and flattening the dough into a larger and larger sheet. Then, when you have reached the desired thickness (2 mm for strozzapreti), you can even the edges (step 6 - pic. B). The dough must not get dry, so quickly cut it into quite regular strips with a wheel cutter or with a sharp knife (step 7 - pic. A). Place the end of one strip longwise on your hand, across the junction of the fingers to the palm (step 7 - pic. B). Slightly bend the fingers so the strips’ edges will overlap in the middle, then roll it carefully rubbing your hands (step 7 - pic. C), so the strozzaprete will still be partially opened. this will allow the boiling water to cook it better and the sauce to fill the gaps (step 7 - pic. D). Tear off with your fingers the rolled up portion of the strip and start over again. If you work with your hands close to the kneading board, the strip will almost roll up itself making the shaping job easier and easier. Add the salt to the water. Drizzle some olive oil on the backing tray and spread it even with a paper towel (step 8 - pic. A). Drop the strozzapreti into the water and let them cook for about 2 or 3 minutes initially moving them with the strainer so they will not stick to the bottom. they don not need to cook completely through, so the timing will depend again on the flour you have been using. As soon as they come up to the surface, strain them out and spread them on the baking tray (step 8 - pic. B). Let them chill completely. Cover them with a towel only when perfectly cold. When ready to serve them with any sauce (even a couple of hours before, drop them again in boiling salted water and finish the cooking: they will need just another 2 or 3 minutes. Blanched pasta can be quite successfully frozen. If so, they will need to be dropped into boiling water when still perfectly frozen. The water will need to be extremely abundant otherwise they will block the boiling for too long and they will inevitably stick to each other.